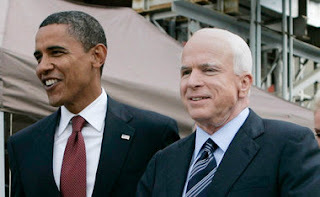 Sen. John McCain (R-Ariz.) said American leadership was stronger under President Trump's predecessor, President Barack Obama, according to a Guardian report published Sunday. Asked if the country stood on sturdier ground under Obama's leadership, McCain said "yes," according to the report. “As far as American leadership is concerned, yes," said McCain, who also vocally criticized many of the Obama administration's foreign policy decisions.